Orbit GT’s new technology supports streaming of imagery and point clouds of unlimited size directly into ArcOnline. 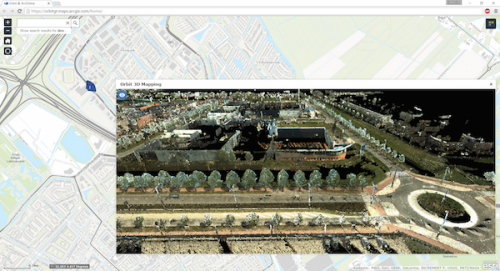 The technology makes Mobile Mapping, from Street Level Imagery up to the vast point clouds representing a complete city or corridor in full 3D, available from within any web page built with ArcOnline or the Web App Builder. It includes Orbit’s unique support for all and any mobile mapping system, introducing a first-of-its-kind standard for this type of content in the Geospatial Business. Your Value is our Goal.